Running is a sport where we incrementally improve our fitness over time. It is not something to be rushed and we should all be patient and allow our body to evolve slowly. Our bones cannot take too much pounding otherwise we can easily get stress fractures or even heel spurs if we take on too much mileage. Our muscles need time to get accustomed to the greater stress and force required to run fast over longer period of time. If not it will manifest injuries like ITB, runners knee, pulled hamstrings…. Time for a short run. Our aerobic capacity does not change overnight so we have to gradually increase our pace or we can easily fall into oxygen debt. Knowing the right speed, the right mileage and the proper mix of intervals, tempo runs, easy run and long runs is the key to improving without getting injured. There are many running clinics and I suggest runners take advantage of them. Some are free, some have fees. Take your pick. The contact information is usually available in the different running magazines available all over the Metro. Or you can get a private coach or join a running club where there are experienced runners who can help you. Remember running is all about incremental improvements. Consistency over time will allow you to reap rich dividends in fitness. Keep your running fun so you will be consistent. See you at the starting line. I started running in 1980. My very first race was a 7km road race in our annual school intramurals. I still have my certificate which they gave out to the top 20 finishers. 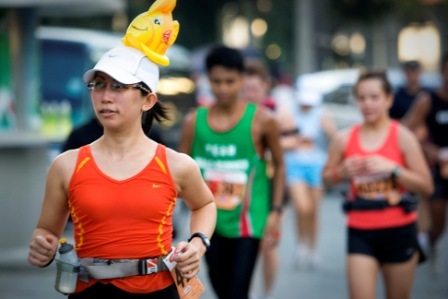 I started to run and race regularly but I never ever thought of joining a marathon. My farthest race was a half marathon and I was in pain the rest of the day. Training for more than 90 minutes was a terrible chore probably because I was always in a hurry and I was not pacing myself properly for the long runs. I ressurected my racing career in 2006 and I started to race regularly. But I stuck to my guns and resisted the urge to run the marathon. 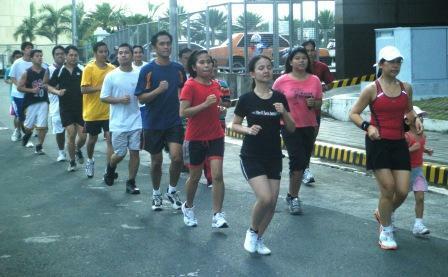 When Condura announced the date for the 2010 Condura run I was one of the many who clamored for a marathon. When Team Condura obliged I felt a moral obligation to finally do a full marathon. As usual my body rebelled during the long runs. I was able to complete the speed work like the Yasso 800’s but completing my long run routines continued to be a problem. As one of the saying goes ” Luck has nothing to do with running a marathon, it is the preparation” or something like that. Well it is true. My lack of mileage and long runs finally caught up with me on the 37th kilometer of Condura. My calves started cramping and I had to take walking breaks to prevent them from getting worse. I always thought I was immune to cramps but the marathon quickly vanquished that myth. I missed my target time and my pride was properly chastised. My only consolations was I completed my first Full Marathon. 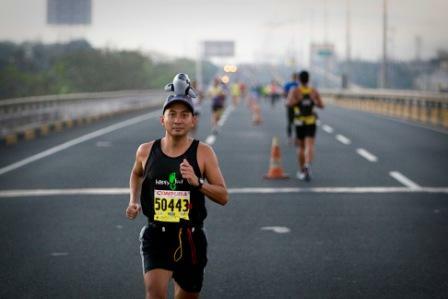 I have nothing but respect for those who consistently run marathons or Ultra’s. They are a different breed. I will think long and hard before I start thinking of running a second marathon. I will probably stick with the shorter races where it does not hurt as much. We kept it fun by running with our trademark sea animal. It was a painful but fun race. Nemo was not available so he sent a friend to run with Tiff! “Run a marathon!” Check, and on to others tasks in my to do list. See you at the starting line and remember to have fun on the run. p.s. I would like to thank Ben Chan for the pictures.